As a business owner for a Cincinnati daycare franchise, always keep your eyes and ears open for outreach programs or ways to speak to a bigger audience. This might include always carrying around business cards with you to hand out at a moment’s notice. This might mean paying more attention when you’re reading the newspaper, walking around the mall, or visiting the town square. There are opportunities abound for business involvement and marketing. For a little more help and diligence on marketing, consider picking up a book or two on business marketing and advertising. All About Kids believes that knowledge is power and that even as an adult, you never stop growing. If you’re serious about using the internet for advertising, but you’re not sure how to make a website for your location, you can always consider hiring a web designer and social media person for your Cincinnati daycare franchise. These individuals can help by getting a feel of who your franchisor is, who you are, then building a website specific to you and your location. If you’re interested in building a blog with content that might interest parents and bring new clients through nothing more than Google searches for information about Cincinnati daycare franchise and the surrounding cities and states. You do not have to be an internet wizard in order to use the internet for business marketing, however do be prepared to spend some money building and maintaining and if you do not want to maintain, steer clear of social media. One of the most common mistakes business owners make in all industries is creating a presence on the internet then forgetting about it. This does more damage than you might think as visitors will note your upkeep, your commitment, and your ability to follow through based on how you take care of your website. So once you get all your material out there, you’ve made the press release, your big grand opening has been out, so what can you do? You wait for the calls and walk-ins for new clients. 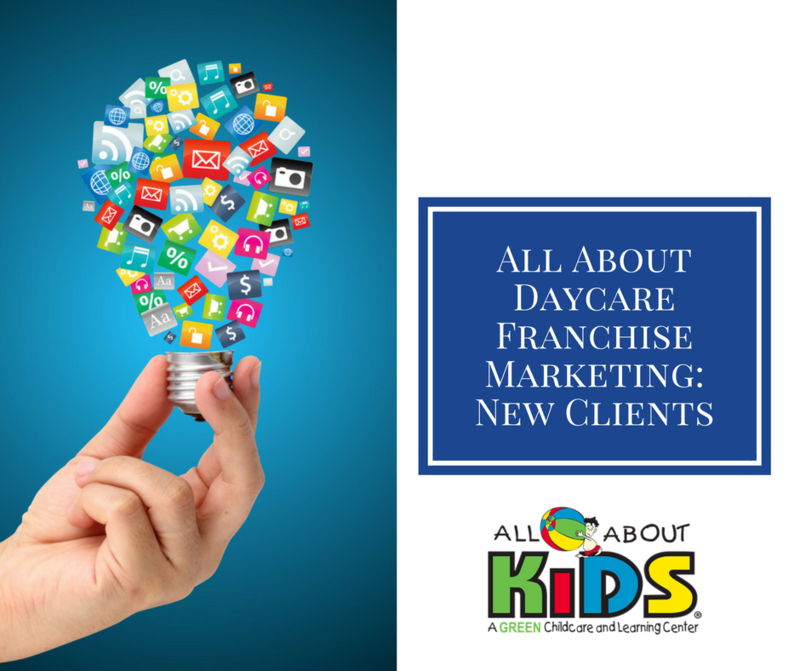 You will want to keep up with normal advertising campaigns such as handing out business cards, posting flyers, and being involved in the community under your Cincinnati daycare franchise’s name. As you bring in new clients, you will have a number of new responsibilities that come with new clients. With advertisements come families who are interested in your Cincinnati daycare franchise as an option for their children. You will have to follow some level of procedure when it comes to bringing on new clients to your Cincinnati daycare franchise. There are a few steps you’ll want to take in order to insure the nature of the families looking to join your daycare franchise family are well suited for your business. Often the first two things you’ll do can be intertwined. Just about all parents will want to tour your Cincinnati daycare franchise before they leave their kids anywhere near it. This is often done during working hours when children are there as it gives parents a chance to see what child supervision looks like at your facility, the varying schedules for classes, and the general organization during the day. Many owners for child care centers choose to do the tours on the same days that they interview the families. The interview often consists of getting to know who the family is, the age of the children they have, and what needs their children have educational-wise and health-wise. If the kids are brought with the parents for this initial interview, take this time to observe what the children are like. Just like with interviewing, you should have a handful of questions prepared ahead of time to ask the parents and you should always bring a pen or pencil with you in order to take notes during the interview. Because tours are given regularly, you should make it a point that all teachers and supervisors keep their classrooms clean and organized, that all of your facilities are well-maintained, and that there are no odors or defects that might turn off the family to your Cincinnati daycare franchise. As you begin your career in child care centers, you will come to find out that not every family is fit for your Cincinnati daycare franchise. There are different families with different needs that you might not be able to fill. You might also find that some families have problematic behaviors, in either the parents or the kids, that you do not want to deal with. Whatever the reason, it’s alright to turn down an individual from the service of your child care center. Some families realize how much trouble they or their children are and will refuse to give information about previous child care centers because they do not want you to have that reference for delinquent payment, problematic children, or constantly bothersome parenting. Make sure that you’re fair when you reject service to a family and that it is not due to discrimination of any kind. If a family asks for certain care taken for a child’s food that you are not prepared to give, such as an all organic diet or an allergy free area for their severely allergic child, you should not feel like you have to comply. It is within your rights to turn down service if you’re unable to provide specific accommodations for someone’s safety in your Cincinnati daycare franchise. While you need clients in order for your business to mean anything in the community, that doesn’t mean you have to accept every child and family that walks through the door, within reason. Remember that refusing service should never infringe on the law or be out of discriminatory purposes, but because you do not have the resources in your Cincinnati daycare franchise to accommodate the needs of the family or because of a history of problematic behavior.